Purview of orthodontic treatment encompasses the maloccluded teeth or abnormal bites. For many of the aesthetic corrections or smile makeover of people, there is the need to correct the misaligned teeth. To make the teeth straighter and improve the cosmetic appearance, orthodontics in Delhi helps people with variety of procedures, important being the attachment of braces, which can be of many types. Most of the braces differ in terms of their appearance, although metal braces work as do the invisible clear aligners. Because of the differences in their appearances, these braces are termed with separate names and their use can be done in patients, as per their requirements and affordability. Going by the traditional means of straightening and aligning the teeth, metal braces were well known. Even the best orthodontics in Delhi used to put up these braces made of stainless steel, attached to the brackets, which are fitted to the tooth. In the field of orthodontics, there are various kinds of brackets and braces, which can be used to align the whole set of teeth, but requires proper expertise. When the braces are fitted in the right way, people do not find any pain or abnormal fit of these wires and brackets. Although technical advancements are a good feature for patients as well as dentists, fitting them on the teeth of the patients requires good hands to handle the way these metallic materials provide smooth fits. Need to have proper fittings for the teeth, is essential. Since there different types of braces, fitting them inside the oral cavity and teeth require deft hands. Metal braces are cheaper options for many people. These require proper attention because of the propensity of the wires to cause injuries, thereby mandating their proper fittings. To provide lightweight materials on the teeth, ceramic braces are nowadays in vogue. Along with being affordable, these can last quite a long time and do not cause injuries. Some of the ceramic braces are nowadays being fitted with transparent wires. Invisible braces are supposedly the best kinds of these brackets. These are also known as invisible clear aligners, because they are made colorless and can take the shape of the teeth. Lingual braces are required to be fitted, when the alignment is required to be done from the inside of the teeth, in contrast to other braces, which are fitted from the outside. Usually, lingual braces are not visible to the outside and are possible to be fitted in cases where the alignment has been slightly distorted. So, the use of a particular kind of brace is judged by the orthodontics in New Delhi by assessing the degree of misalignment and therefore is a good means of giving proper shape to the teeth. 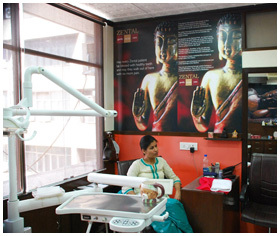 People are gradually becoming aware about the best orthodontics in South Delhi and also giving proper attention towards their teeth appearance. As a result, they seek out the right dental clinic with good orthodontics and select the kind of braces to be used. All kinds of braces have their pros and cons, ranging from the invisible braces to that of the invisible clear aligners. Such practices have become common because of the large degree of correction of smile and cosmetic dentistry possible through the orthodontics procedures.